The March 2019 release of CoreRelate applications (MatterLink, Docket Enterprise, Assemble-It and LegalBar) is now available. Visit the download page to access the package and detailed release notes (monthly and cumulative.) Valid login credentials are required. 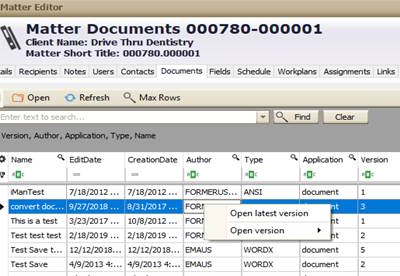 Our document management integrations, including the new one for Work 10, connect matter-related documents to MatterLink and Docket Enterprise, enhancing the “everything in one place” case management convenience that our products provide. Not using Work 10? Our other CoreRelate – DM integrations include iManage 9.3, NetDocuments, Worldox, and Open Text. If you use Docket Enterprise with the online court rules provided by CalendarRules, you will be interested in these two new enhancements. Each child event has specific rule text, provided by CalendarRules. Sometimes the rule text specifies a “time of day” deadline. In the new release, your firm has the option to schedule these events at the specific time, instead of scheduling them as “all day” deadlines. The new way requires turning on an administrative setting. 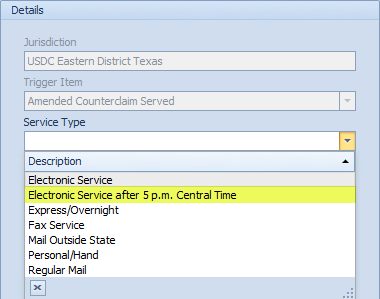 You should consider this carefully…do your attorneys like the “all day” presentation, at the top of their daily schedule in Outlook (knowing the time specific information is present in the rule text)? If so, do not implement the new setting. On the other hand, if your attorneys would prefer to see these deadlines at their specific times, make the change. Be aware that a CalendarRules child event will be “in line” with anything else on the calendar and the attorney may have to scroll down on a mobile device to see it. These two screen captures show the difference. In the first, the two CalendarRules child events (they are green) are “all day” and display at the top of the calendar. In the second, they are scheduled at specific times. Note that even with the new administrative setting on, only child events with time-of-day specifications will be impacted. Most child events do not have this and will continue to be scheduled as “all day” events. For complete information about all of these enhancements, and a few bug fixes in the release, please review the Release Notes.